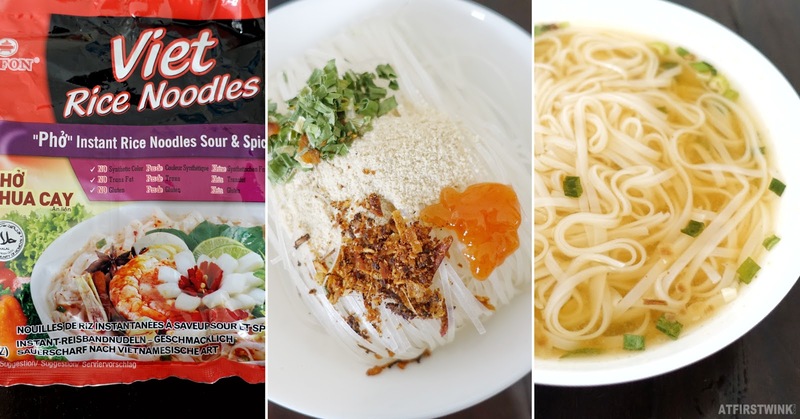 Some time ago, I saw that there was a 3 for €1 offer for the Vifon Viet Rice Noodles at the Amazing Oriental supermarket in Rotterdam and since they are inexpensive, I decided to give them a try. I got three different flavors: chicken, beef, and sour & spicy. After my visit to the Vietnamese restaurant, Little V, I started to be more interested in Vietnamese food. I was already a big fan of rice noodles, but I have never tried a really authentic bowl of pho before. I should really find a place for that soon. But before I do that, I will share my thoughts on these instant rice noodles. There were three small satchets inside, containing: the dried vegetables, chicken soup powder, and an orange-red chili oil. Although it looks like it would be very flavorful, the soup tasted like a bland chicken stock, which is not too salty and not spicy or sour at all. 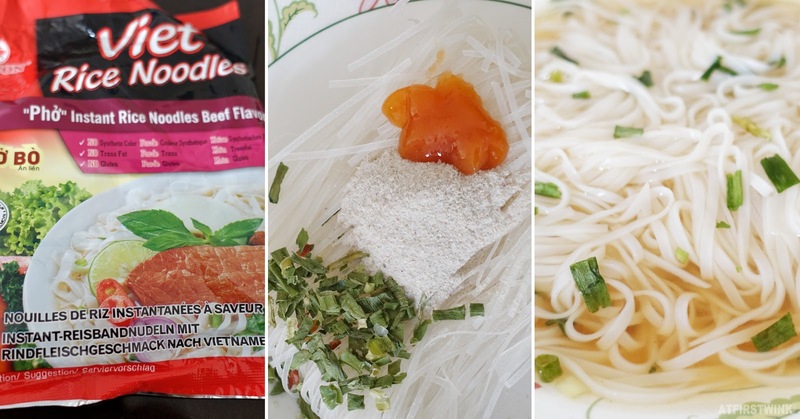 Just like the chicken flavored rice noodles, the beef flavor has three satchets with dried vegetables, a beef soup powder, and a chili oil. Out of the three flavors, I like this one the most. It actually has a noticeable beef flavor and it tasted reasonably good. Instead of three, this sour & spicy flavor has four satchets: dried vegetables, sour & spicy soup powder, chili oil, and fried seasonings. I really thought I would like this one the most, as I like the Tom Yum flavored YumYum noodles. But it wasn't the case, the flavors were mixed in a strange way and I didn't really like it. Even without the discount, the instant rice noodles only cost €0.50 per bag. However, the bag is a bit small and I need about 1.5 bag to get a filling meal out of it. It is best to cook three bags at once and share it among two people. I really like the silky smooth texture of the rice noodles, which still have a slight bite to them. It is really impressive for something that didn't require cooking and just needed to be soaked in hot water. The soup is not the best, but you can always use leftover ramen soup satchets from other brands or make your own soup. 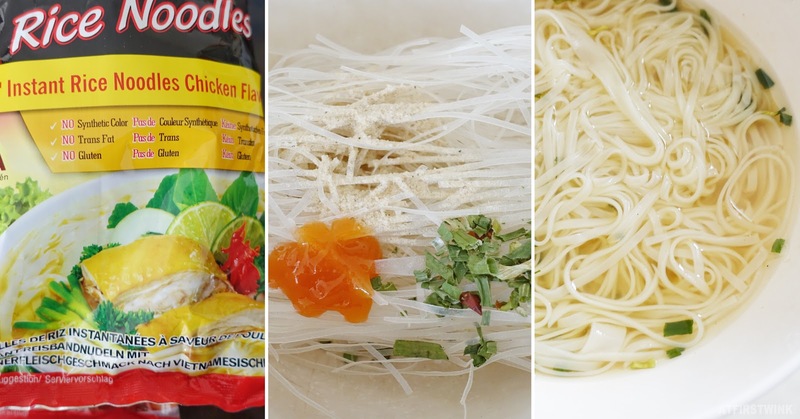 - Put the dried rice noodles and all soup base packs into a bowl. - Pour about 400 ml of boiling water on top until everything is covered. - Cover the bowl with a flat plate and wait for 3 minutes. - Remove the plate and stir well before serving.